In the past three weeks, we merged 181 PRs in the Servo organization’s repositories. Our Windows nightlies have been broken for several months for a number of reasons, and we have now fixed all of the known breakage. If you’re a Windows user, give our latest builds a try! You can visit arbitrary URLs by pressing Ctr+L. The Android Components project added a component to use Servo in any Android app. 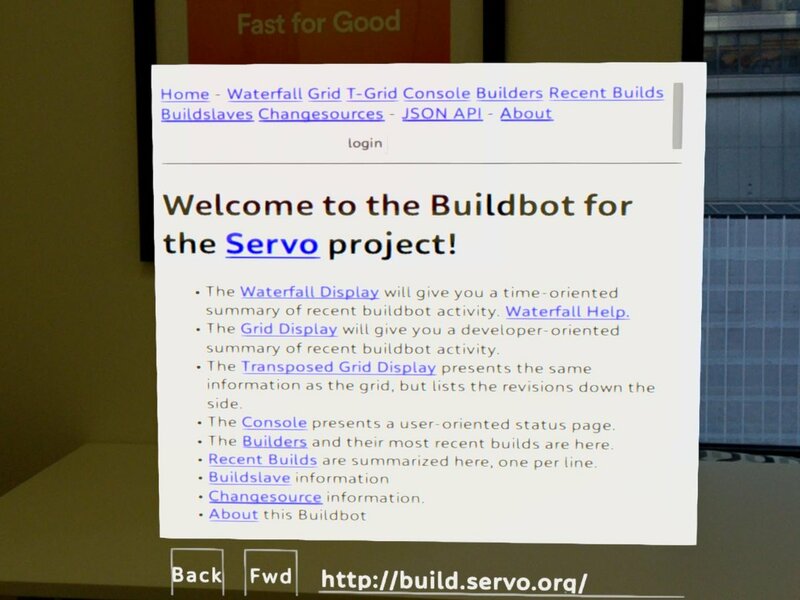 paulrouget is integrating Servo into Firefox Reality. pyfisch is rewriting keyboard input to better reflect the web’s input model. ceyusa implemented support for <video> and <audio> element playback. pyfisch extended our border image implementation to support thickness and gradients. ferjm made some WebAudio nodes match the specification a bit better. pyfisch and jdm updated the version of WebRender in use. ferjm enabled the Android backend for media playback. SimonSapin redesigned the Taskcluster CI setup. jdm corrected the flickering of WebGL content on Android builds. codehag updated several parts of the devtools implmentation to work with modern versions of Firefox. jdm made stdout redirect to Android’s logcat by default. ferjm hardened the media backend against errors. jdm made it easier to debug JS exceptions and WebGL errors. nox reduced the unnecessary duplication of work performed by the putImageData API. paulrouget harded the JNI integration layer. nox consolidated the various byte-swapping and premultiplication operations. ferjm made it possible to reuse AudioBuffer objects. jdm fixed some graphical glitches on Oculus Go devices that affected images without alpha channels. emilio improved the CSS animation and transitions implementation. jdm prevented reloading a page from hiding all previously loaded images.